This is a sponsored post for Hamilton Beach. All opinions stated are my own. A good food processor is one of the most important appliances in my kitchen, and it seems like I rely on mine even more during the holiday season. Especially for things like chopping nuts and cranberries–jobs that can be so time consuming when done by hand. Which is why I love the Hamilton Beach Stack and Snap™ 10 Cup Food Processor. 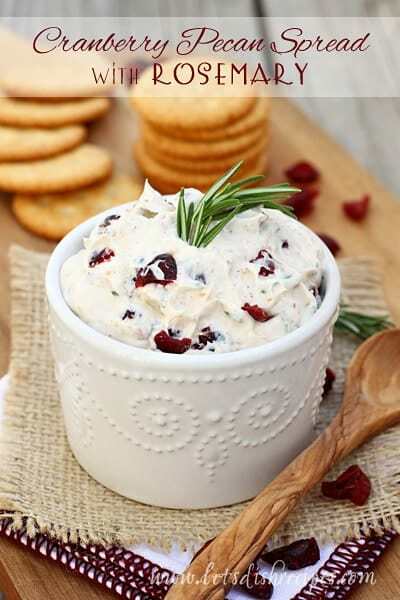 It makes quick work of preparing dishes like this Cranberry Pecan Spread with Rosemary, and who doesn’t love a little extra help in the kitchen, especially during the holidays? My favorite feature of the Stack and Snap Food Processor is that the blade locks in place so it stays put during pouring. With other food processors, I was always dumping the blade into my bowl of salsa or pot of hot soup and having to fish it out with my hands. I also love that there’s no tricky twisting or turning required to lock the bowl in place when assembling the food processor. And the blades, bowl and lid are all dishwasher safe–a must in my opinion! The food processor also comes with a reversible slicing/shredding disk–I use it all the time for grating cheese–and a wide mouth feeding tube, which means less chopping before adding your ingredients. The 10 cup capacity is also a big plus when feeding a family and making larger recipes for holiday entertaining. This short video highlights all of the great features of the Hamilton Beach Stack and Snap™ 10 Cup Food Processor. 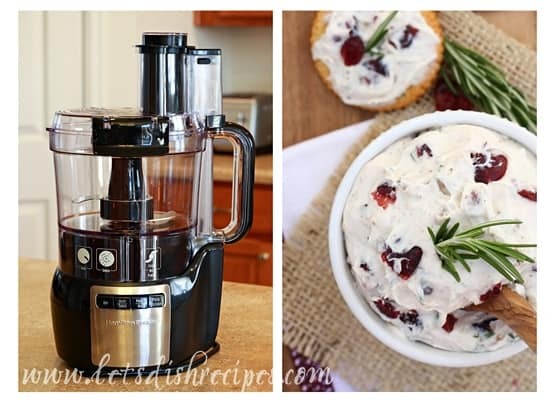 The Stack and Snap Food Processor helped me whip up this delicious cranberry pecan spread in about 5 minutes. Just a few quick pulses were all it took to chop the nuts and cranberries. And with a hint of rosemary and honey, it’s the kind of holiday appetizer that’s easy to make, but sure to impress. I like to keep the ingredients for this dip handy so I can mix it up at the last minute for unexpected guests. 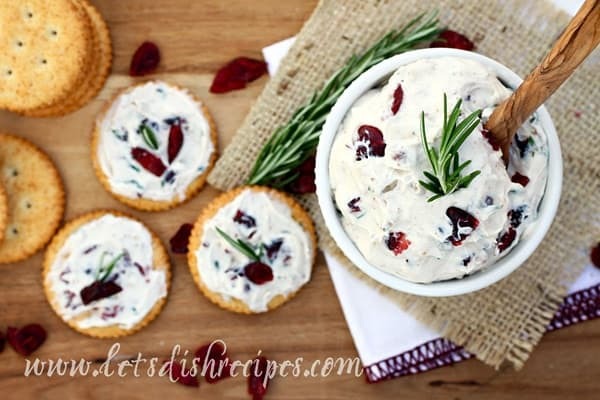 The rosemary gives the dip a very earthy flavor, so use more or less to suit your tastes. I like a chunkier spread, so I chop my pecans and cranberries in the food processor then mix everything else together by hand, but if you prefer a smoother spread, you can do all your mixing with the food processor. This spread is also delicious with walnuts or almonds, so use whichever you prefer, and be sure to have your favorite crackers handy for serving. Add cranberries, pecans and rosemary to the bowl of a food processor and pulse several times until coarsely chopped. Add cream cheese, honey and salt to bowl and pulse until ingredients are well combined. 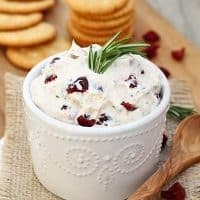 (For a chunkier spread, stir chopped cranberry and nut mixture into the cream cheese by hand, then stir in honey and salt). Refrigerate until serving. Serve with crackers, pretzels or bagel chips. Use it to make Christmas cookies! christmas cookie tasks, for sure. For multiple cookies that I’ll be preparing. I just made a chocolate pie and needed to borrow my neighbors’ to get the job done. I would love a food processor! I would use it to make pie dough and homemade nut flours. I will use it to help chop various nuts that I will need this season! I’ll use it to make sugar cookies. I always use my food processor to make pie crusts! Currently do all my chopping by hand, and seldom get nuts, fruits or veggies small enough. Would use this handy food processor for just about EVERYTHING! This would be such a versatile tool in my kitchen. As my arthritis in my hands gets worse, using something like this would be ideal for chopping, shredding, slicing, and mixing all sorts of things! I would love to win this! Making dips, pesto, dough…anything goes! I’d use it for pie crust, chopping veggies, making dips, salsas and, wow, just about everything! I plan on turning out some awesome pie crusts if I win! I use this for EVERYTHING. Homemade pesto and Rum Balls would probably be up there as the first two things I would make though. I would use this to chop nuts for cookies and other things for other items that need chopped. I would love to win this as a holiday gift for my cousin who’s getting married. Yay! I have been thinking that I need food processor to make my own hummus; the store stuff is just not that great! Chop the nuts for the cheese balls. This looks like the most delicious spread ever and I hope I win! I just love your blog! To chop the nuts and dates for the date nut balls, the pecans for the russian tea cakes, the ingredients for cake balls and oreo truffles, shredding cheeses for fondues… so many things! I’d use a food processor to make this dip! Among other things. I’ve never had one and would love one. I would grind pecans for wedding cookies, chop tomatoes and onions for salsa, chop up vegetables for salsa , and chop up nuts for windmill cookies. I would use it for making homemade pico de gallo. Thanks for the giveaway! We make home made dressing, so this would be used heavily for that. I’d use it to make homemade bread crumbs. Would love to use this to make pie crusts. I like to make homemade butter in the food processor. I would use it to make homemade cranberry relish. I would use it to make sauces, shredded cabbage, and nut butter. Made it and loved it! Even my MIL said she liked it and she won’t eat anything associated with me. It’s best if it sits for a few days so that the cranberries can soften up just a tad. I cheated and used chopped pecans (or pecan chips depending on which brand you buy). I may have added a little more rosemary than called for but I can’t help it – it’s a weakness.